Teaching and Learning ‘Market Place’ CPD. 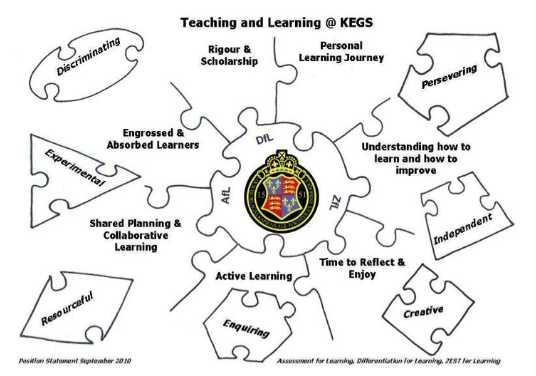 A key strand of our ‘research-engaged’ philosophy and practice is that all KEGS teachers are involved in a Teaching and Learning Workshop throughout the year. This is in addition to the CPD that takes place through departmental meetings, individual CPD courses and the routine practice of ‘reflect and refine’. We are looking to explore new innovations and ideas. The workshop groups meet on six specified occasions across the year plus any time in between that is planned spontaneously. Some are within departments; some are inter-departmental. Some people work in pairs, others in larger groups. A range of different methodologies are employed and the only requirement is that the work enables teachers to develop their practice in line with our one-page Teaching and Learning Statement – the Zest for Learning Jigsaw which pretty much covers everything. Last year we asked for a definite link with formative assessment but this year, it was wide open. The idea is that by maximising the degree of autonomy teachers have in designing their own CPD, the more effective the process will be in delivering an impact for students; it is more rewarding for all concerned. In May we held the annual event we call the ‘Carousel’ which provides an opportunity for teachers to share their work to-date with each other. Essentially this has a market-place feel about it with various stands set up in a number of neighbouring spaces; teachers then mill about (without any structure imposed) talking to each other, sharing ideas, taking turns to run their own stalls and to visit all the others. After 90 minutes and a break, we then gather in groups to reflect on what we have gained from the carousel activity. A final meeting of the workshop groups will wrap up the year’s work and a report-back from each group will then be collated. Talking Texts Project: exploring the power of ‘reading aloud’ and bringing language ‘off the page’ to enhance students’ understanding in a range of subject areas. This is a comprehensive project run in several departments. Teachers are reporting significant gains from taking time to read aloud in class. It also involved asking parents of Y7s to read aloud at home. The ‘Learning through the looking glass’ project, using video to record student learning activities in several subject areas for reflection and evaluation, both for the teacher and the students. Developing critical thinking through practical work in science: withdrawing some of the scaffolding so students planned their own experiments to a greater degree. Using post-its and mini whiteboards for feedback. Many teachers use these techniques but this was an opportunity to evaluate the impact of the methods in different contexts. Using feedback stickers to highlight recurring areas of formative assessment – instead of writing the same comments repeatedly. Developing Maths A level extension materials – using Oxbridge questions to stretch the most able and also simulate problem-solving for the whole class. A good example of where subject-specific development is really important and powerful alongside general pedagogical ideas. Promoting independent essay planning in Philosophy, identifying all the possible viewpoints students might be expected to take in an exam (evidently 26 in all!) and creating opportunities for them to develop and rehearse these in advance, without spoon-feeding and without leaving it until the exam for them to work out their opinions! It is a recurring issue for us that students assume they will have their moment of clearest thinking during the exam…. Peer Observations between English and History, focusing on clarity of expression and precision. This pair explored the use of language in expressing ideas and, through peer observation, found significant common ground between the two subjects. Developing a more effective approach to A2 History coursework, building opportunities for constructive feedback, using a mini-coursework activity on unseen material to develop skills. Here the group sought to resolve the difficulty in not giving feedback on coursework (as per exam board regs) whilst trying to provide some formative development; the mini-coursework was very effective and time-efficient in this regard. Developing peer-to-peer academic mentoring with Year 12s, using a model developed at our partner school in Germany. The idea here is that mentoring is often pastoral in nature -but academic mentoring helps students to resolve practical issues around learning, organisation and managing workload and has the by-product of creating a space for more personal issues to also be dealt with in cases where the students would not normally come forward to express them. Developing Y7 Maths starter activities – exploring a range of specific ideas. Exploring the use of Forums and Wikis on KEGSnet (our moodle-based VLE) in Year 9 Geography. KEGSnet is well established as a document store for all students but the more interactive elements are less extensively used. The wikis are very popular with students; some of the outcomes are fabulous. Exploring the power of visualisers to embed AfL techniques across a range of subjects. We have developed our own low-cost in-house visualisers and anyone who wants one has one. This group explored their potential in areas such as chemistry experiments. Making links between Music and Maths to enrich students’ appreciation of a range of mathematical patterns and rules and composition techniques. This was a lovely piece of work, stimulating interest in students and teachers. We will be involving Sue Brindley from Cambridge to help guide us with this process. Thank you to all the staff involved for your enthusiastic participation. A really interesting model. I like the fluidity and flexibility – the outcomes speak for themselves! Thanks Karen. The chat/buzz amongst staff straight after the event is so fantastic – a good sign that this is what motivates us. This sounds really motivational for staff. Did they come up with the groups? How were the topics proposed and groups organised? The groups were formed in a two-way process. Some people got together to suggest areas of exploration; others then joined existing groups. It was coordinated by an Assistant Head and various key group leaders, mainly Middle Leaders who have run groups in the past.